Soon after he became General Motors CEO in September 2010, Dan Akerson spotted great promise in Mary Barra. She was running GM's human resources department, and it was "the worst application of talent I've ever seen in my life," Akerson said in an Oct. 13 interview. "I was sitting there going, 'Why the hell were you in HR?'" Akerson said, quickly adding, "Not that HR is a bad function." Akerson changed that situation in January. He tapped Barra to lead GM's global product development. He says she brings "a different set of talent and attributes" and has "a broad perspective on what we need to do globally." Barra's HR stint was a diversion from a career spent mostly in GM's manufacturing and engineering enterprise. Still, her appointment raised eyebrows because of her relative lack of hands-on product experience. Akerson said Barra impressed him early on with her ideas and the respect she commanded from peers. She replaced Tom Stephens, whom Akerson calls "a genius" and "still a very, very important part of our technical organization." 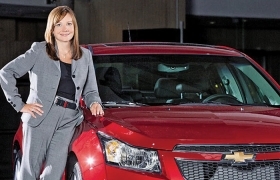 Akerson made Stephens GM's first-ever global technology officer. Akerson has had chief technology officers at his previous companies, but GM had never had one. Akerson calls Barra "very methodical and at the same time, very creative" and "one of the best talents I've seen in my working career -- not GM; my working career."